Men’s smart casual is a tripwire laden subject in this era of blazer and shorts ensembles. Previously, Mango HE SS12 provided good examples for smart casual dressing; but recently, I got to learn of a Korean men’s outfitter by the name of Comodo Square. There’s little information on them but when it comes to menswear, a picture speaks more than a thousand words, it’s a tutorial especially when it comes with campaign looks. COMODO SQUARE 2013 SS Fashion Film from 10 CONNECTION on Vimeo. During my early career where I worked marketing for a company running nightclubs, I wore all shades of v-necks under my blazers. Smart casual demonstrated here by Comodo SS13 pairs the dramatically formal one-button peak lapel with tailored trousers and then layers the ensemble under the jacket with a detail laden cardigan and v-neck tee combo- smashing! 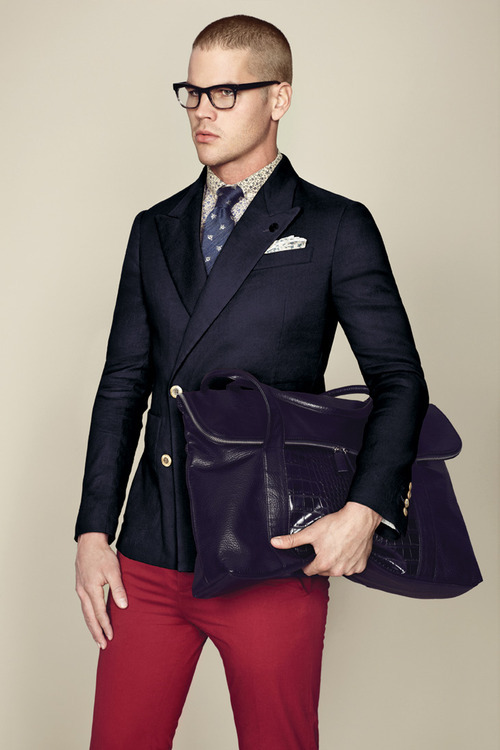 The navy blue suit is something every Monsieur should own in his wardrobe. While the full suit is the ultimate weapon in business or dinner formal, the navy blazer paired with khaki or in trend-worthy burnt orange or mustard is the quickest and easiest way in dressing down navy or blue jackets. Comodo Square Korea does pretty nifty formal men’s suits as well. A suit isn’t something you only wear on formal occasions. Remember- break it up and pair it down.